I read this book for my first work-place club. We have yet to discuss it, but I wanted to write a bit about it here. I’m not sure I would have picked this book up on my own, as I have a habit of chain-reading historical fiction books (bad thing? I’m stuck in another time…) Needless to say, the subject matter is not entirely far removed from my taste and aesthetics. I love fantasy, sci-fi, and magical realism. There are definitely some elements of the latter in Bookstore. Having read American Gods a few months ago, I picked up on Gaimen-esque elements in Bookstore, which was welcome. I couldn’t help but be reminded of reading the Harry Potter series (just to be clear, there is no actual magic in Bookstore) only because there was this unknown element in which the reader had no idea what was going to come next in this seemingly parallel world to our own. I could relate to this book not just because it’s about a twenty-something navigating a bad economy, but also due to the integration of technology and social media. Google is heavily involved in this book, and I don’t want to say too much, but you find yourself wondering if some of the stuff Sloan says about Google is true (i.e. “Google Forever” division.) Okay, probably not, but he writes it in such a way that it doesn’t seem completely impossible (hey, Google glasses are a “thing” now.) Also, Sloan often says things in which the reader doesn’t quite know if he’s serious or joking with us. Most of the time, I’m sure he’s not serious. This book has an indie/quirky feel, complete with a manic genius pixie dream girl who works for Google. If you’re looking for a fun read, give this one a shot. P.S. 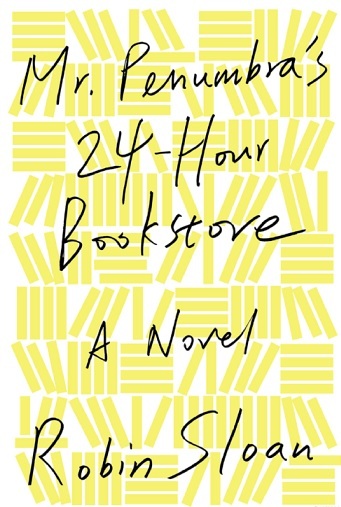 Robin Sloan self-published his first book, and a shorter incarnation of Bookstore was also self-published. There’s hope for some of us!